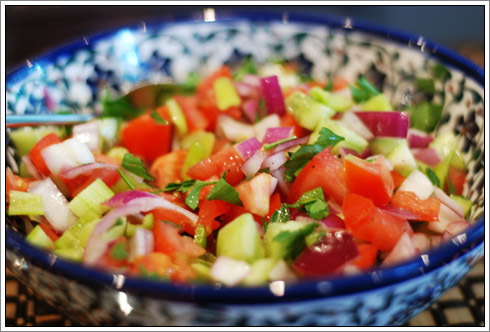 Continuing with the Turkish theme, this is a salad that reminds me so much of my childhood. My sister and I had a succession of Au Pairs when we were small - Spanish, French, Hungarian and Turkish. We invariably spent a lot of time with them, us helping them with their English, and they in turn looked after us, keeping us out of trouble, and cooking for us. We adored most of them, and they all left their mark on us in some way or another. A Hungarian Au Pair taught us how to make wonderful paprika and sausage stews and some very rude Hungarian swearwords. And one of the Turkish Au Pairs taught my sister and I how to make this delicious summer salad. We used to come home from school and instead of pigging out on pizza and pasta, would frequently make and devour this salad, mopping up the juices with lots of fresh bread. It became known as Arzu Salad, after the Au Pair who made it. It is this kind of recipe that I love - food that someone else adores, and makes for you in the hope that you will fall for it too. Chop the onion and then leave it to soak in lightly salted, lukewarm water for 15 minutes (this draws out some of the bitterness from the onion). Try to chop the other vegetables around the same size as the onion. While it is soaking, peel and chop the cucumber, chop the tomato making sure you retain as much juice as possible, then de-seed and chop the peppers. Add the lemon juice and olive oil, then season to taste with salt and pepper. Drain, rinse and then add the onion, roughly chop the parsley and then toss all the ingredients together. Serve as part of a selection of salads with plenty of fresh, crusty bread to mop up the juices.